MAX Architects, in partnership with Wildstone, have been longlisted in Islington Council’s Open Call for Design Ideas for the Old Street Iconic Gateway. Key objectives of the competition include creating a high-quality, flexible gateway that encompasses public art, embraces the concept of Tech City, mitigates the impacts of air and noise pollution, stimulates economic growth and creates an inclusive space where local residents can engage with digital media and technology. The brief also included several existing fixed elements to be integrated into the design and a budget circa £1 million, which proposals could exceed if additional funding sources were provided. A lucrative existing advertising contract had to be incorporated into the proposals. 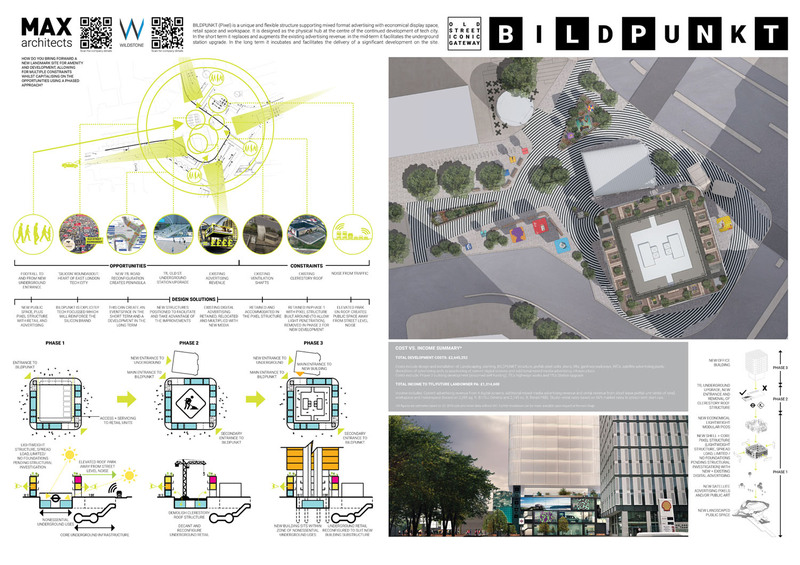 Our proposal BILDPUNKT (Pixel), number 07, can be found here as well as below. Please vote for our scheme by taking the survey. Old Street Roundabout is a site whose problems have never stayed still long enough to galvanise a strategic solution. While there is a clear opportunity for a significant building and public space at the heart of the heart of tech city, previous concepts have been thwarted by the constraints. Solutions have been short term and ad hoc, with many interesting proposals unable to square the conflicting circles of transport, development, advertising and a Borough-boundary location. To help ensure this latest competition breaks the cycle, we propose a framework of intervention which allows a linear programme of development to evolve. Combining Architecture and Landscape design with specialist Advertising and Media delivery, we aim to route map the short, mid and long term solutions. The connection between the tech aspirations for the site and the possibilities offered by next generation interactive advertising and display are obvious, given the existing advertising contract. We propose to create a limitless framework for advertising and display that can accommodate the rapidly evolving technology and spatial requirements of multi-media advertising, while attracting small scale retail and F&B kiosking, tech start-up enterprises and young makers and artists. Created from a series of upscaled 3D spatial pixels, this structure can be managed and curated centrally to provide an evolving programme of revenue generating activity. Each ‘pixel’ is formed of a 3.65m cube (derived from a 365mm digital display module) which can accommodate 2D and 3D physical advertising installations, digital or multi-media displays. 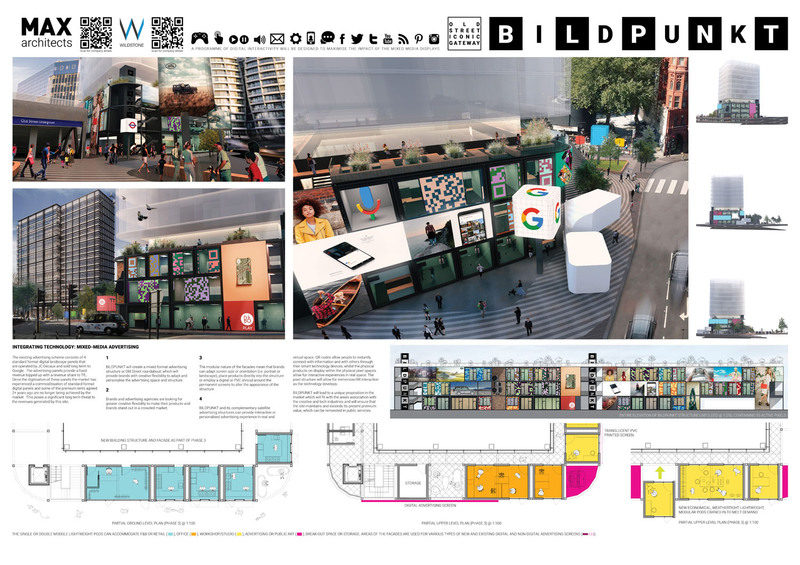 The pixel can be configured at ground with prefabricated retail /display kiosks and at upper levels with workspace. Multiple pixels can be configured to create large scale content. The lightweight structure accommodates the existing structures onsite and compliments the new tube entrance. The load is spread over a wide footprint with limited/no foundations/groundworks (pending structural investigation) and set within a new landscape continuing the tech theme. A raised park is created above the traffic and the bustle of the ground plane. The structure is designed to create an active hoarding during the station upgrade. We propose to demolish the clerestory roof, creating a works site for TfL. The retail at concourse level can be reconfigured to facilitate a new building above. The new tube entrance can be accommodated in its proposed location, connecting to the existing concourse and ticket hall. The Pixel structure can continue to generate revenue and provide amenity on the peninsular. A landmark SME tech hub can be constructed within the Pixel structure to complete the regeneration of the peninsular. The Pixel structure can remain in situ guaranteeing the mixed-use placemaking credentials of the scheme in such an open, prominent and public location.